I had been riding Compasses for quite some time. I had about 2k miles on my Barlow Passes (pre-tubeless flavor) and replaced them with Snoqualmie passes in order to take advantage of my tubeless rims and whatnots. That's where my problems began. I've gone through 4 Snoqualmies. About 100 miles in, one got a small cut from a small piece of glass and the sealant wouldn't close it. I bought a new one. The back tire developed a bulge at about 250 miles and was warrantied, which took about a week and a half. One blows off the rim before the bead sets so it has to be run with a tube. I learned that the hard way. My right ear was right next to it and I suffered hearing loss from their bad quality control. So half of the tires were defective, one wasn't very good, and one was fine. None measured out to the claimed 44mm unless I put them on a 26mm internal width Blunt SS rim. Anyway, when Soma announced their 48c Supple Vitesses I was stoked. I rode their previous 42c version, but since the black tread to skinwall ratio was off I got rid of them (I have mild OCD). The bead on the new SVs are officially tubeless. They're much tighter than Compasses (which you can take on and off with fingers) and sealed up instantly, even on the rim that the Compasses blew off of. Ride quality is probably better than Snoqualmies too. Snoqualmies tend to grip and wrap around everything, including uneven pavement, which makes the bike handle funny under load. SVs have a slightly stiffer sidewall so that doesn't happen. Interesting. We get a lot of requests to review Compass Tires for the site. You don't mention what pressures you are running the Soma tires at. How do you like the Otso? I'm not at all expert on gravel tires and tubeless applications. But, I do have many years of road riding and racing under my 74 year old belt. Coming from my roadie background, with some brief experience with tubeless Maxxis Ramblers, and Tubeless Panaracer Gravel Kings, I had some basis of comparison between knobby tubeless gravel tires and my 35mm Compass Bon Jon tires which I've put several thousand miles on, since mounting them in March. I would also point out that I have the light casing version of the Bon Jon's which use casing material used for road tubular tires; and I'm running them with Challenge latex tubes, rather than tubeless. My unscientific observation is that the Bon Jon's are fast tires - much faster than either the Ramblers or GK's. I notice this difference in performance both on dirt and gravel roads, and especially on pavement, where I have no difficulty holding my own on fast group rides. I ride about 50/50 on maintained rural NH roads, but frequently hit washed out sections, with 1" gravel, pot holes, and mud. I also occasionally, tackle lose freshly graded roads with lots of lose rocks and 2" of soft dirt. So far, my Bon Jon's have proven durable and puncture proof running at 30/35 PSI. I know that my experience proves nothing. Maybe I've just been lucky. There are so many other factors that influence the performance and durability of a specific tire, that I know I can't say for sure that another user will have the same experience. I too, am hoping that someone with more clout and experience will conduct a good test and review. I used the Compass Snoqualmie Pass for a local fondo last fall in Winthrop Washington and I have some Bon Jon's on now. I haven't had any issues yet. Both run tubeless with Orange Seal. I've ridden both pretty hard on some pretty rough gravel here in the Seattle area. So far I really like these so I'm happy to hear the Soma's are an option too. Interesting they are also made by Panaracer. Guitar Ted, It would be great to see a review of the Compass tires as well as the Soma's! 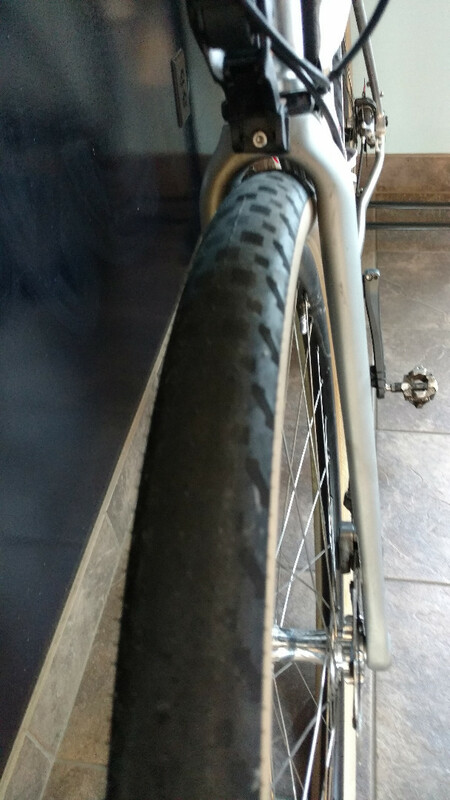 Just an observance - Both Compass Tires and Soma tires are made by Panaracer. I would suspect QC is performed by Panaracer. I could be the Compass don't work well with the rims you are running? I ran the Compass Snoqualmie pass for about 500 miles and had decent luck with them. In the end they got a little slit in the tread that wouldn't seal up with orange seal. Felt they were a little too fragile for some of the rides I do in the flint hills (I live a couple hours away but make it there occasionally). Also my I had them on and off the rim a number of times and the bead had definitely stretched a fair amount by the last time I put them on. All in all Compass makes an OK lightweight tire that will work for some but has some definite limitations. Also I think tube users have much better luck then tubeless guys. Switched to some 40c Maxxis about 250 miles ago and so far been really liking them. Right now I air the tires up to about 35f/40r, which is too high for extended gravel but ok for little urban connectors in Minneapolis. I let em sit for a few days between reinflations. I'm not super scientific about em and just push down on them before heading out. Me+bike is about 225 lbs. I loved my Barlows, but they were the pre-tubeless flavor. I packed on 15 lbs of muscle (and fat) between those and my Snoqualmies. I think my Barlows were around 37, so 5mm less than my Snoqualmies. I'm guessing between that and the weight gain was what caused them to handle funny. Think of like the self steer of really low pressure fat bike tires. So far I'm not getting that on the SVs. I think it's the slightly stiffer sidewalls. Compass sidewalls are so thin you can practically count how many fingers you're holding up behind them. My Vaya frame is still in the garage, so if I remember I'll test fit these. I should update my post. On identical rims the front is 48.5mm and the rear is 49.5mm. I wish there was a guide with rankings for tires in terms of suppleness, maybe that's something GT could put together! I'd love to know how compass compares to soma to challenge to the many WTB tires in this range. You're totally right about trade offs. Even these Somas I might not take out to the middle of nowhere. I'd trust my Gravelking SKs more for that, though I did take my Snoqualmies into the Superior National Forest last year and kinda got lost. Compasses are definitely more supple than Somas. I just think the big ones are TOO supple for my weight. My wife loves her 650b x 48s and she weighs even more than me, but isn't as OCD about tires. I had the 42mm version on the SVs before in the EX/extended wear. The tread was a lot thicker than the sidewalls so it compressed funny when you really cranked hard. It made for a strange bouncing feeling. When/if Panaracer makes the GK slicks in big boy sizes I'll make the switch to those. I ran the 28 slicks on my road bike for a while and they were damn near perfect. I like the feel of a stiffer tire run at lower pressure compared to a supple tire at higher pressure. Lately I've been running 700x52mm WTB Thickslicks on my Sequoia at 13 PSI front and 15 PSI rear and it's been lovely. I ran my Snoqualmies at 32/36 PSI and a pair of Specialized Sawtooths (42mm) at 26/30 PSI. Of these I like the feel of the Thickslicks the most. I am probably in the minority regarding the stiff vs. supple debate though. There's some sidewall seepage and I have to inflate the tires every 48 hours or so. It's to be expected since they're not butyl lined, but kind of annoying. With supple tires you really notice differences in pressure. Speaking of which, I'm currently running 30/45. I have a lot of headset spacers though. Not much visible wear on the front, but the rear is showing some baldness. All in all, great tire for pavement, ok for some gravel, and not a replacement for legit gravel tires. I'll buy another set when these wear out. Thanks to all the posters on this thread. As an old fashioned roadie and recent convert to unpaved roads, all of this stuff about wider tires, tubeless, disc brakes etc. has been eye opening. While I knew that Panaracer manufactured the Compass tires, I didn't know that they also made tires for other smaller companies like Soma. It is hard to know if there are differences between the quality of these offerings. As far as J H, I've been reading his blog and subscribe to Bicycle Quarterly. On the one hand, I believe that he is passionate about cycling, and strongly committed to his beliefs about bike tech. He and his crew actually ride, test, and use the stuff they sell. I doubt that he is getting rich as a result. Of course, their testing lacks scientific precision, and since it is based on personal subjective experience, it is clearly subject to biases. I'd like to see some independent testing. Just because JH is honest and dedicated, doesn't mean that his opinions are right, or that his product offerings are right for me. None the less, I enjoy reading his blog and B Q, and along with other industry experts and voices, after 74 orbits around the sun, I'm still learning and experiencing new things about cycling and bikes. I just mounted up a pair of these, in the EX version. On DT R460s with two layers of tape I could mount them without tire irons. The rear pumped up with just a floor pump, the beads snapped in place with two little pings at around 30psi and it even held air overnight with no sealant. The front wouldn't quite get there with a floor pump, but locked up pretty good with a CO2 cartridge. A few more strokes with a pump got it up to working pressure and there were a few more pings of the bead snapping into place. Seems perfectly good. They are ridiculously sticky as mentioned - I have some trees outside that are dropping little seed pods and coming back from the test ride it look like my tires were coated in crushed peanuts. I will throw another tire in the bunch. I put the Kenda Flintridge Pros in 40 mm tubeless on my Tamland right before the Pony Express ride. I don't think they are as fast as the Clement MSO that were on there stock. Some of that might be I was riding the rear at 50 lbs. psi because of that tire being tubed. The Flintridge shine though when you hit the rough stuff. Beginning of the ride I was picking my lines as the ride progress I didn't worry where I was riding and left the bike run wherever it wanted to. I was impressed with them in the flint in Kansas. at 200 lbs I ran 40 in the rear and 35 up front. I have to start using thicker tape, not the cheap 8898 from Amazon. Sealant leaks out and into my spoke holes with my current rims. I lost a ton of air on a commute and barely made it home. I put the bike in the stand to check for punctures. None in the front but the sealant was all gone. The rear had a chunk of what I think is a shep pallet and a little piece of metal. I gotta patch it up but I think they'll be ok. It's a good excuse to retape my rims and rotate the tires. The rear is showing some wear. Welby- do you notice a bouncy feeling when cranking hard on the EXs? No, not really, but I usually run big tires in the 30 psi range. Cool. When these wear out I'm planning on trying either the EXs or Shikoros. I have around 700 miles on em and may be able to get almost 2k out of the pair, but I usually resell tires early so I'm not sure. Also, eventually the stickiness wears off the tires. I didn't know there were SL and EX versions until I noticed that the box said EX. I think they've just got a little more rubber in the center, but they didn't feel any thicker than any other bike tire. Definitely not Marathon territory. I have to start using thicker tape, not the cheap 8898 from Amazon. Sealant leaks out and into my spoke holes with my current rims. I lost a ton of air on a commute and barely made it home. I put the bike in the stand to check for punctures. None in the front but the sealant was all gone. The rear had a chunk of what I think is a shep pallet and a little piece of metal. I gotta patch it up but I think they'll be ok. It's a good excuse to retape my rims and rotate the tires. The rear is showing some wear. Welby- do you notice a bouncy feeling when cranking hard on the EXs? One thing to note since you're using 22mm ID rims; 24 mm tape is more narrow than ideal. WTB recommends their 28mm tape for that size and I agree based on previous experience. Sealant tends to find its way under the tape unless you can run that tape up high. If you already have a roll of 8896 sitting around, I would do 4 layers with half offset as far to one side as you can go and the other half offset to the opposite side. The spoke holes will have 4 layers and you should be able to run any pressure you like if you ever had a reason to go small tire/high pressure. I know some groups like Stans say 21mm tape on a 21mm ID rim is fine, but after dozens and dozens of tubeless setups, it just seems like sealant gets under the tape when the tape is <4mm wider than the rim ID or anytime Gorilla tape is involved. Tire removals and installs can accelerate he process as well. The width of the tape wasn't an issue. The 3M stuff I was using is just really thin and not very malleable so it would leak sealant through the bubbles and folds. The rims are rewrapped now and when I'm off crutches in a few days I'll patch up the Somas and remount them. These Gravelkings roll like poop comparatively and aggravate my knee. The new tape job helped a ton with air retention. I only inflate every 4 days or so, and that might be because of temperature fluctuations here in MN. It's not as long as a good tubeless mountain tire, but I'd rather spend 45 seconds pumping up a tire than sacrifice ride quality. I used vulcanized tire patch kits on my damaged rear tire and moved it to the front. No issues at all with it, and since I was at 700ish miles it was about time for a rotation anyway. 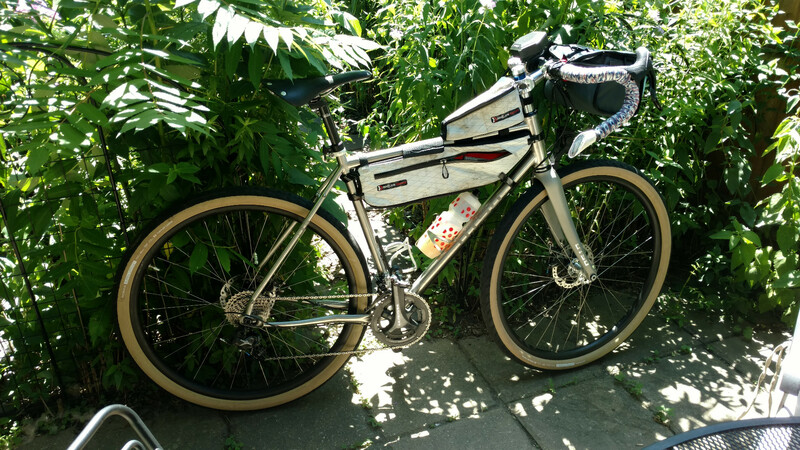 I installed (had installed professionally) a pair of Bon Jon 35's- extra light on HED Belgium + rims. My installer told me that he didn't have too much trouble installing them and used 2 oz. of Orange Seal endurance in both wheels. But, after receiving the wheels, the tires required several weeks of TLC, before they would hold air reliably. After about a month, or about 400 miles of regular riding, they now hold air as well as any other tubeless tires. I guess these tires are problematic for tubeless application. A lot depends on the rim, and on your patience. In all honesty, while I love the performance of these tires for the type of riding I do, I can't recommend them for everyone. Cranky- I've been wearing ear protection (like you'd wear at the range) when changing tires lately. I can't recommend them enough.